Looking for a new breakfast nook after a busy morning of inspections? 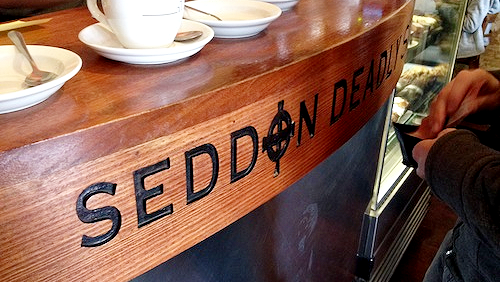 This week Street News writer Jessica Hoadley gave into temptation at Seddon Deadly Sins – and it never tasted better. 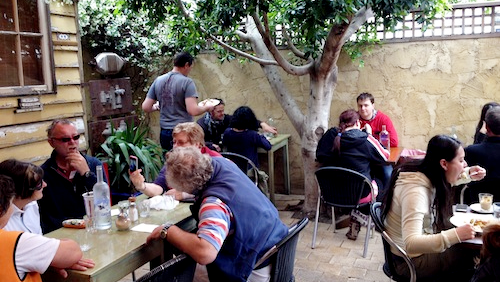 Opposite the Macedonian Orthodox Church on Victoria Street, Seddon, this little redbrick café is where locals of all faiths congregate every morning of the week. My friend and I arrive at 10am on a grey Saturday morning. We’re shown through the busy front and back rooms to the rear courtyard, which is nicely sheltered from the wind. Sail shades protect us from the chance of any rain, and the heaters are cranking, creating a cosy space amongst the honeysuckle growing on the rustic yellow walls. The breakfast menu is divided into the Christian ‘seven deadly sins’, allowing customers to choose between Pride and Sloth, Wrath and Lust, and so on from menus printed inside children’s Little Golden Books. You know, classics like The Poky Little Puppy and The Jolly Barnyard. Bibles would better suit the theme, but I guess they’d be a hassle for the waiters to lug around. “What’s the best one for a hangover?” asks a woman in dark sunglasses. Me, I opt for Envy. Beer-battered haloumi with two poached eggs and bacon, served on baby spinach with an onion-fig-chilli jam. I can never go past haloumi when I see it on a menu, and today is no different. 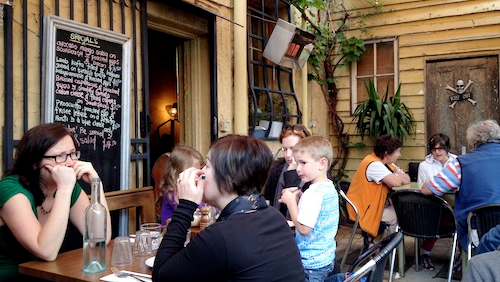 ‘Heart attack on a plate,’ the little angel on my shoulder chastises me. ‘But it comes with spinach,’ argues the little devil. The meals arrive quickly. My deep-friend haloumi is mouth-wateringly crunchy and molten, becoming chewier as it cools, and the fig in the chilli jam gives it a delicious grittiness. There’s no need for toast, and the spinach saves me from too much guilt. 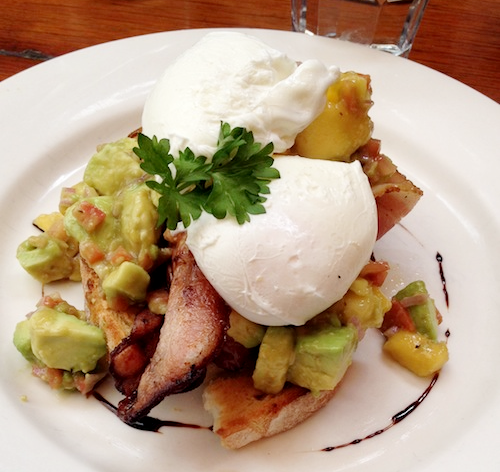 My friend orders a special: mango and avocado salsa with poached eggs and bacon on sourdough. The food envy hits him halfway through our meals, which is lucky for my arteries, so we swap. His mango salsa is sweet and tangy, the perfect complement to the richness of the haloumi. “And we’re all happy?” the café co-owner, a hulky dude in work boots and an apron, checks in with us. “Mm hm. Mm.” We can’t even talk. Come to the dark side. Sinning has never tasted so good.